Minnesota State University, Mankato will hold its Homecoming Parade this fall in downtown Mankato for the first time since 1970. The parade will be held Saturday, Sept. 29 at 10 a.m. The 1-mile downtown parade route is approximately double the distance of the ½-mile campus parade route used in recent years. 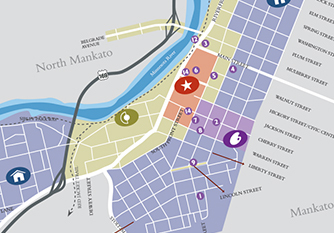 This year’s parade, scheduled to last for an estimated 1-1/2 to 2 hours, will begin on South Front Street at the corner of West Liberty Street and proceed through downtown Mankato on South 2nd Street and then through Old Town on North Riverfront Drive for its final six blocks.